We catch a lot of fish ... and we have fun! Hi! You probably found our web site through a search engine or maybe you saw one of our print ads in a magazine. If so, then you're probably a little overwhelmed with how many other fishing guides there are to choose from! If we were in your position, we would be thinking to ourselves, "Why should I contact these Total Fisherman folks? What makes them worth hiring? Are they going to be any better than the other guides I've found?" Let us give you some of the reasons that we think set our guide service head and shoulders above the rest. Customer service: It doesn't just mean knowing how to bait your hook, it means patiently explaining how we do everything and why we do it. From tying hooks to anchoring and driving the boat, if you want to know about it then we want to pass on our knowledge. Our reasoning for this is simple, it's so that if you wanted to go out on a fishing trip of your own, then you would have the knowledge to have a fun, safe and successful trip. When your fishing with us, you will leave with information that will make you a better angler. The right match: Not every fishing guide is a great match for every customer. There are good fishing guides and not so good ones, the same thing is true of customers and most often this is because the customer and the guide have different expectations. In order to set the appropriate expectation of what you can expect from a trip with us, here are a few of the things we will do and won't do. 1. We won't spend all day talking on the cell phone and ignoring you. Sometimes we may have to answer calls from interested customers and also talk briefly with other fishing guides about where the fish are biting and what they are biting on, but we try to limit the amount of time we spend on the phone. Why? Because you didn't pay to here us gab on the phone all day. 2. We won't do anything that will jeopardize your safety. Safety is our highest priority. We have never had a person get hurt in either of our boats. Our safety record is perfect. Why? Because you wont come back fishing with us if we hurt you or scare you. 3. We won't talk your ear off all day long. Some folks like fishing guides that will tell them story after story and lots of jokes. We're not that kind of guide service. We're good for an occasional funny story but we can hardly ever remember any of the hundreds of great jokes we hear. Why? We would much rather hear about your experiences, get to know you better, and answer any questions that you might have. If we're doing all the talking it's hard to do this. Don't take this the wrong way, we're not quiet on our trips, and we are both great conversationalists, but the trip isn't about us ... it's about you. 4. The fish you catch is going to be handled with care, put on ice while it is on the boat, and cleaned before you take it home. Why? The fish we catch are amazing creatures and they deserve to be treated properly so that they taste great when you put them on the dinner table. Icing down and bleeding your fish allows it to retain the great taste that you expect. 5. We wont use cheap or inadequate gear. We use only the highest quality equipment. You won't find any cheap "off brand" or "good enough" rods, reels or tackle in our boats. We don't buy cheap rods because cheap rods break, and they break on YOUR big fish and that is unacceptable. The rods we use are known for their quality, reliability and time tested performance. We don't buy cheap reels because big fish will destroy anything but the highest quality reel. We've seen it happen, big sturgeon and hot salmon or steelhead leaving an angler with a handful of parts or a "smoked" drag. Our 28' & 37'' custom made Willie & Yellowfinboats are some of the finest guide boats on the water. Here is a list of some of their features. The boats have extra high sides to keep you in and the water out. The boats are 9-10' feet wide so you have lots of room to stretch out and to fight fish! High back swivel seats with armrests. Each seat has it's own welded on cup holder. Hot water sink to wash your hands. 2 wash down hoses to keep blood and slime off the floor so you won't slip. Onboard fish cleaning station inside the fish box. Latest electronics, GPS and fish finder. VHF & Sattelite Radio to contact the Coast Guard, other fisherman or to get up to date weather reports. Powerful, quite, environmentally friendly Yamaha 4 stroke outboard motors. Two 2000 gallon per hour bilge pumps, just in case. 2-5 batteries, just in case. Why do we put such a focus on high quality equipment? We get to go fishing all the time, so we always get another chance at the big one that got away. Many of our customers only get out fishing a few times a year. We're not going to risk your first fish or your trophy fish of a lifetime to save a few bucks scrimping on gear. 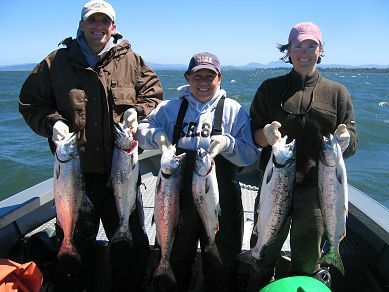 When you hire us your going to go on one of the best guided fishing trips in the Northwest and one of the reasons is the great equipment you will use. 6. We're in the loop. We talk with other guides and expert fisherman about where the fishing is great. When you go fishing with us, we are going to be headed for a spot on the river that has been producing fish. We take you to fishing locations where you have the best opportunity to have a great fishing experience. We go where the fish are! 7. Service after the sale. We enjoy it when our customers call us back months after a fishing trip to ask our opinion about a product they are buying or want some tips on where the fishing is hot. Some times they are outfitting their own boat and are going on their first trip for a certain species and have a question on technique. We're going to be there to answer your questions. Our goal is to make you a better fisherman and that doesn't stop when you leave our boats, so call either of us and fire away with those questions! We never get tired of answering them! 8. We work hard to get you into fish. We've noticed through the years that the harder we work in the boat the luckier we get! Hard work and attention to detail equals consistently catching fish, and can mean the difference between an average day and a great one. 9. We love being fishing guides! We love being on the water with new friends and enjoying the many beautiful areas we fish. We sometimes talk with my customers about their previous experiences with other fishing guides, and they tell us about the guide being frustrated or impatient or acting like he didn't really want to be there. Our take on this is that there are some (not many) guides out there for whatever reason who are stuck being a guide, they cant move onto another career choice even if they wanted to. We're not one of those guides. Kevin has a Bachelors degree in Business Administration from Washington State University, and he says "The day that the fishing guide business turns into a "job" for me is the day I will go find something else to do." Lacey has a Masters degree in Education and feels the same way. We're not stuck doing this, therefore you won't be stuck in a boat with somebody that's just doing this for the money. 10. This is where our hearts are at. You can always tell a mile away when someone loves what they do. We're one of those people.